1879-1880 autograph album of Emma Sprague of Watertown, Wisconsin, with signatures from fellow members in temperance societies, including many who attended a conference at Detroit, Michigan, in 1879. Read more about the temperance movement up until 1881 in the book The Comprehensive History of the Rise and Progress of the Temperance Reformation from the Earliest Period to September 1881, by Peter Turner Winskill, published in 1881. 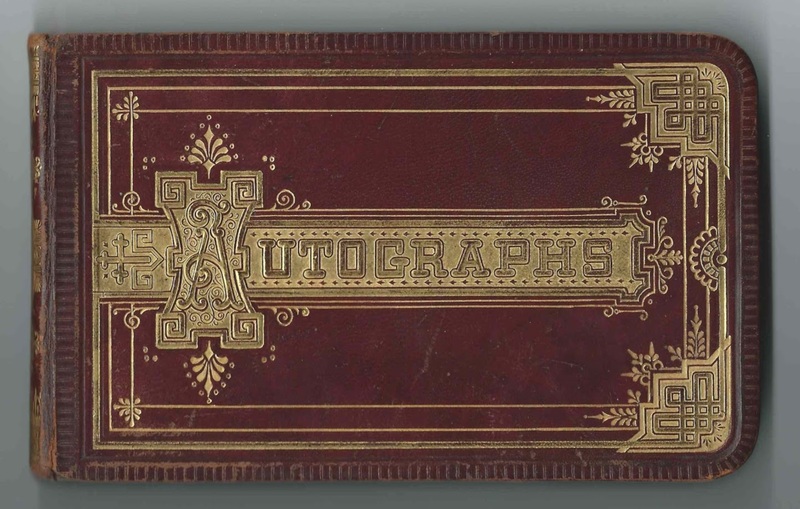 The autograph album of an Emma Sprague of Lancaster, Wisconsin, is featured in another post. The album is approximately 7" x 4-1/4" and contains the sentiments of 90 of Emma's friends and "brethren". An alphabetical surname list and an alphabetical list of the signers, together with any personal information they offered, appear at the end of this list. One signer was Eugene W. Clafin, twice a candidate for U.S. President on the Prohibition ticket. He inscribed his page at Waukesha, Wisconsin, on June 5, 1879. Right Worthy Grand Templar Theo. D. Kanouse prepared a report in advance of the 1879 convention, which you can read here. Both he and his wife signed pages in Emma's album, he on February 15, 1880, and she on February 17, 1880. Charles C. Southwell inscribed a page at Milwaukee, Wisconsin, on June 26, 1879 and included a sketch. If you have information on Emma Sprague of Watertown, Wisconsin, please leave a comment or contact me directly. Thanks! Signers in the album [Note: Given names within a specific surname may not be in alphabetical order. Jen M. ? [possibly Wms. for Williams] of Cambria, Wisconsin, signed on June 11, 1879; "Friend and Sister"
"Your young sister "Gaynor J." Mrs. M. C. Atwater, signed at Milwaukee, Wisconsin, on June 26 [no year written, but presumably 1879]. "May the indicent of the Evening be ever uppermost in your mind when you think of Milwaukee__" "Faith, Hope & Charity"
Jennie M. Atwater of Milwaukee, Wisconsin, signed on June 26, 1879; "Yours Fraternally"
Libbie M. Barter of Markesan, Wisconsin, signed on July 7, 1879; "your sister"
R. W. Crampton, G.W.C. of Illinois, 572 Madison St., Chicago, 25th Session, R.W.G.L., [Right Worthy Grand Lodge] Detroit. Kate M. Curry, "yours in F.L. & T."
J. Ervin of Minneapolis, Minnesota; middle initial possibly V or ? Nelson Gill of Oshkosh, Wisconsin, signed on September 4, 1879. "Faith, Hope & Charity"
Samuel ? Hastings of Madison, Wisconsin, signed on May 28, 1879. I think his middle initial was D for Samuel D. Hastings. "your brother"
H. L. Haylett, signed at Menomonee Falls, Wisconsin, on "6-9-1879"
Susie Haylett, signed at Menomenee Falls, Wisconsin, on "6-8-1873"
Ed. A. Hendrickson of Watertown, Wisconsin, signed on February 18, 1880; "your brother"
J. J. Hickman, R.W.G.T., presumably Right Worthy Grand Templar, of Louisville, Kentucky. Eunice Hooper, P.W.V.T. [Past Worthy Vice Templar] of Illinois, Pana, Illinois, signed at Detroit, Michigan, R.W.G.L., May 28, 1879. Right Worthy Grand Lodge. Miletus Knight of Durand, Wisconsin, signed on September 4, 1879; "Your Brother"
Elmer E. Paddock of Markesan, Wisconsin, signed on July 8, 1879; "yours in F.H. and C. (Faith, Hope & Charity); T. L. and P."
Mrs. L. Paddock, signed at Markesan, Wisconsin, on July 8, 1879; middle initial perhaps I or C or J or ? Ella M. Potter, signed at Platteville, Wisconsin, on November 9, 1879; "Your Sister"
Homer L. Pound of Chippewa Falls, Wisconsin, signed at Madison, Wisconsin, on September 4, 1879. "Yours in F.H. &.C. [Faith, Hope & Charity]"
W. T. Price of Fairchild, Wisconsin, Excelsior Lodge, 374 L.D. George A. Spruce, D.C.T., 9th Dist, 132 Grand Ave, Milwaukee, Wisconsin, signed on June 25, 1879 "May we meet in our next convention"
J. H. Stewart, signed at Madison, Wisconsin, in 1879: inscribed to "Dear Friend & Sister"
Josiah Thomas; "your friend and brother"
Lillie E. Wilson of Markesan, Wisconsin, signed on "7-6-1879"
There is an Edwin Hendrickson, Watertown, age 18 in 1880. Also a Lee B Skinner, age 19, in 1880, also in Watertown. Thanks, Ed. I wondered about that one, too, and it's always fun to see a possible Maine connection!